In a perfect world some precautions would be taken so that the researchers, or some of them, have to behave as if it were a double-blinded experiment, otherwise it might be too tempting to see in the data patterns that they already know ought to exist. A question: how were the 780,000 selected? That too ought surely to be treated as an exercise in experimental design, with randomisation at some agreed level of scrutiny. 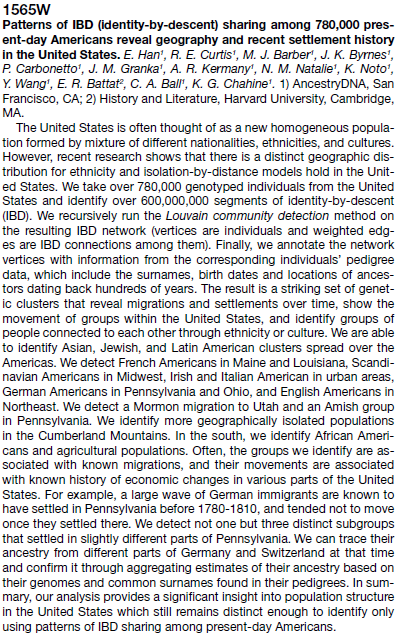 The latter one uses longitudinal Census data to track the actual ancestry components across the country, which agrees with (and is finer-grained than) the genetic models. …we know that those British traditions are visible in modern genetic data from Britain, so it is quite likely possible. I’d just like to see if they actually did it. And of course we know that the ancestry.com/23andMe people aren’t exactly representative of the population (not for the least reason that genetic testing costs $$$). yeah. sampling is the big problem here, and, for the reasons jayman stated, these data are not a truly representative sample, alas alack. still – it’s a start! imho, i think nearly all of today’s genetics research should be viewed as part of an ongoing investigation in which there will be twists and turns — and maybe even radical new directions — as new evidence is uncovered. but we (i mean, teh scientists) have to start somewhere!